Barrett’s oesophagus, also called Barrett syndrome or Barrett oesophagus, refers to an abnormal change (metaplasia) in the cells of the lower part of the oesophagus. It is characterized by the replacement of the normal lining (epithelium) of the oesophagus by a different type of epithelium that contains cells which are usually found in the lower gastrointestinal tract (called “goblet cells”). This change is called intestinal metaplasia. The condition was named after Dr. Norman Barrett who described it in early 1950’s, when he noticed that cells lining extending from the lower oesophagus were secreting red mucous without causing inflammation. It is now known that there is strong association between Barrett’s oesophagus and oesophageal cancer (about 0.5% per patient-year). Oesophageal cancer is very often a deadly cancer and Barrett’s Oesophagus is now considered to be a premalignant condition. The oesophagus is the muscular tube that leads from the mouth to the stomach. Swallowed food travels down the oesophagus and passes through a weak ring of muscle (sphincter) into the stomach. Reflux occurs when the acidic contents of the stomach squeeze through the sphincter and enter the lower oesophagus, causing symptoms such as heartburn or regurgitation. The cells of the inner lining (epithelium) of a normal oesophagus are pinkish-white, flat cells (squamous cells). The cells of the inner lining of the area affected by Barrett’s oesophagus are tall, red cells (columnar cells). The columnar cells are similar to the cells that line the stomach. 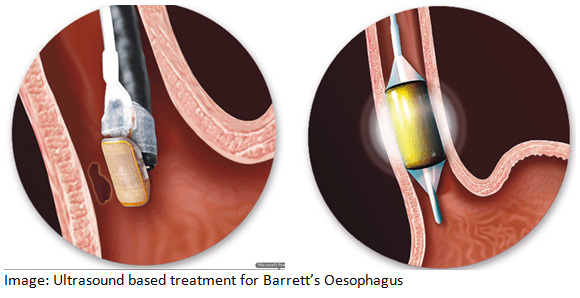 The cause of Barrett’s Oesophagus is hotly debated, but some authorities postulate it is due to an adaptation to chronic acid exposure from reflux oesophagitis or gastro-oesophageal reflux disease (GORD), in which food and gastric liquids can enter the oesophagus from the stomach. It is this exposure over the years to acid that leads to the change of epithelium. The acid irritates the lining of the lower oesophagus and causes inflammation (oesophagitis). With persistent reflux, eventually the lining (epithelial) cells change to those described above. The incidence of oesophageal adenocarcinoma has increased substantially in the Western world in recent years. The condition is found in 5–15% of patients who seek medical care for GORD. The oesophagus is a muscular tube that is located in the chest and serves to transfer food from the mouth to the stomach. The lower oesophageal sphincter (LOS) is a valve that is located at the junction of the stomach with the oesophagus. Its function is to prevent acid and other contents of the stomach from coming back into the oesophagus. GORD is a condition in which excessive acid-containing fluid refluxes (flows) back into the oesophagus, in part because the lower oesophageal sphincter is weak. The weakness of the LOS may be related, in part, to the fact that virtually all GORD patients have hiatus hernia. In hiatus hernia, the upper few centimetres of the stomach slides back and forth between the abdomen and the chest through the diaphragm. This sliding may interfere with how the sphincter works as a barrier to reflux from the stomach to the oesophagus. It is thought that about 1 in 20 people who have recurring acid reflux eventually develop Barrett’s oesophagus. The risk is mainly in people who have had severe acid reflux for many years. However, some people who have had fairly mild symptoms of reflux for years can develop Barrett’s oesophagus. Barrett’s oesophagus seems to be more common in men than in women. It typically affects people between the ages of 50 and 70 years. Other risk factors for Barrett’s oesophagus that have been suggested include smoking and being overweight (particularly if you carry excess weight around your middle). It is about twice as common in men as in women, and much more common in Caucasian men than in men of other racial background. A significant percentage of individuals with chronic symptoms of GORD develop Barrett’s oesophagus, and it is most common in Caucasian male populations. Not everyone with GORD has symptoms of GORD, however. Therefore, some people with Barrett’s are unaware that they have Barrett’s because they have no or very mild and infrequent symptoms. Symptoms of Barrett’s oesophagus are usually no different from regular heartburn and may be fairly trivial. This means that many people don’t seek medical treatment until their condition is quite advanced. In fact, most people with cancer of the lower oesophagus have not been previously diagnosed with reflux. Barrett’s oesophagus has very few easily detectable symptoms and is difficult to diagnose without an endoscopic examination. Pain under the sternum where the oesophagus meets the stomach. Unintentional weight loss because eating is painful. These symptoms may be caused by problems other than Barrett’s oesophagus, but if you have persistent symptoms, you should seek advice from your family doctor who may choose to refer you to be seen by a Gastroenterologist to discuss if you need a gastroscopy, a medical procedure to examine your food pipe and stomach under sedation. Diagnosis requires endoscopy (or more accurately gastroscopy, during which the doctor inspects the oesophagus, the stomach and part of the small bowel). The gastroscope is a thin flexible rubber tube which has a tiny camera at the tip to allow photos to be taken. One sign the doctor will look for to confirm you have Barrett’s is the colour of the tissue lining the lower oesophagus. If you have Barrett’s it will change from its normal pink colour to a deeper salmon or orange colour. The gastroscope also has a small channel for the doctor to insert instrument to take small samples called biopsies. The samples then are sent to laboratory to be examined by a histopathologist, who would confirm if Barrett’s changes are seen. The presence of goblet cells, called intestinal metaplasia, is necessary to make a diagnosis of Barrett’s oesophagus. Barrett’s changes are classified into four general categories. The grade of a cell is what it looks like under a microscope. The less normal the cells look, the higher the grade. Cells with low grade dysplasia are mildly abnormal. Cells with high grade dysplasia are more abnormal. If it has been explained to you by your Gastroenterologist that you have Barrett’s oesophagus, it is usually recommended that you undergo routine gastroscopies on a regular basis (the interval is 1-2 yearly or sooner depending on the degree of cell changes and the length of the affected area). Your Gastroenterologist would be the best person to obtain the advice as to how often you should have a gastroscopy. By having regular check-ups, your doctor can detect changes that indicate higher risk to progression to cancer when the cells begin to show pre-cancerous features (called dysplasia), which can be treated before it grows to become a cancer. There is evidence that the rate of cancer caused by Barrett’s oesophagus is on the increase. The type of cancer that occurs with Barrett’s Oesophagus is called adenocarcinoma. This cancer is different from the type that arises from the squamous lining of the oesophagus, which is called squamous cell carcinoma. Among Caucasians, the rate (frequency over time) of squamous cancer is decreasing relative to Barrett’s-associated adenocarcinoma. Smoking and excessive alcohol ingestion are definite risk factors for squamous cancers. They also are risk factors for adenocarcinoma seen in Barrett’s Oesophagus. In this situation, however, it is not clear if smoking and alcohol increase the risk for adenocarcinoma by making GORD more severe, or if smoking and alcohol have a more direct cancer-causing effect, as occurs in squamous cancer. Squamous cell cancers have become increasingly less common, while adenocarcinoma diagnoses have risen. Adenocarcinoma incidences in Caucasian males has risen more steeply than in other ethnic groups. Early diagnosis and treatment of gastro-oesophageal reflux may prevent the development of Barrett’s oesophagus. If you have been diagnosed with Barrett’s, your doctor will probably recommend you take medication to reduce the amount of acid your stomach produces and have regular endoscopies to detect any early cell changes that might lead to cancer. You should always discuss with your doctor if you have symptoms of heartburn or painful swallowing that persist for longer than a few days. To reduce risks of cancer transformation, you should strongly consider strategies to help you quit smoking, and to reduce alcohol consumption. High-grade dysplasia and early stages of cancer can be treated by endoscopic resection and new endoscopic therapies such as radiofrequency ablation. Treatment is recommended to reduce the risk of developing cancer which might be as high as 10% per patient-year. The risk of malignancy is highest in men more than 50 years of age, with more than five years from the time of being diagnosed with Barrett’s Oesophagus. Although in the past physicians have taken a watchful waiting approach, newly published research supports consideration of intervention for Barrett’s oesophagus to prevent cancerous transformation. Radio-frequency ablation.Ultrasound based therapy (radiofrequency ablation) is a new treatment modality for the treatment of Barrett’s oesophagus and dysplasia, and has been the subject of numerous published clinical trials. The findings demonstrate radiofrequency ablation has an efficacy of 90% or greater with respect to complete clearance of Barrett’s oesophagus and dysplasia with durability up to five years and a favourable safety profile. Photodynamic therapy (PDT). This is a type of laser treatment. For this, you are given a medicine that makes your cells very sensitive to light for several hours. After taking the medicine, you will have a gastroscopy. During this procedure, a laser light is shone at the abnormal section of your oesophagus. The cells which are sensitised by the medicine react to the laser light and the cells are destroyed. Nearby normal cells then multiply and replace the destroyed abnormal cells. There are possible side-effects from PDT which include narrowing of the oesophagus (called a stricture) which may affect swallowing. Also, some people may develop skin reactions because of the medicine that is used. Endoscopic mucosal resection (EMR). This is a procedure that is done via instruments passed down the side of a gastroscope. Basically, the affected inner lining of the oesophagus is taken off, after using water containing blue dye to lift the area away from the underlying muscle layer. Some doctors recommend acid-suppressing medication for the rest of your life, but it is unclear as to whether treating the acid reflux helps to treat or reverse your Barrett’s oesophagus and more studies are ongoing. However, this treatment should help any symptoms that you may have. Research continues to find out which treatment is best. If you are diagnosed with Barrett’s oesophagus, your specialist should be able to give you up-to-date information on the pros and cons of surveillance. They should also be able to advise on the current situation about the various treatment options should you develop dysplastic changes to the cells. If you develop high-grade dysplasia or cancer of the oesophagus, the traditional treatment is to have an operation to remove the oesophagus (oesophagectomy). This is a major operation and complications following surgery, sometimes serious and life-threatening, are not uncommon. But remember – most people who develop Barrett’s oesophagus do not need to have surgery. You can specifically ask your doctor the treatment options for Barrett’s Oesophagus. Many professional medical societies propose endoscopic screening of patients with GORD and endoscopic surveillance of patients with Barrett’s oesophagus. Barrett’s oesophagus is a pre-malignant condition. When cancer develops, oesophageal cancer has a mortality rate of over 85%, and most patients survive less than 1 year. By having routine “surveillance” gastroscopies as recommended by your Specialist, high-grade dysplasia can be treated. If cancer is detected early, it can be treated successfully by surgery. For further advice and information, you can request an appointment, or call one of our receptionist team on Rosebud Rosebud Endoscopy .